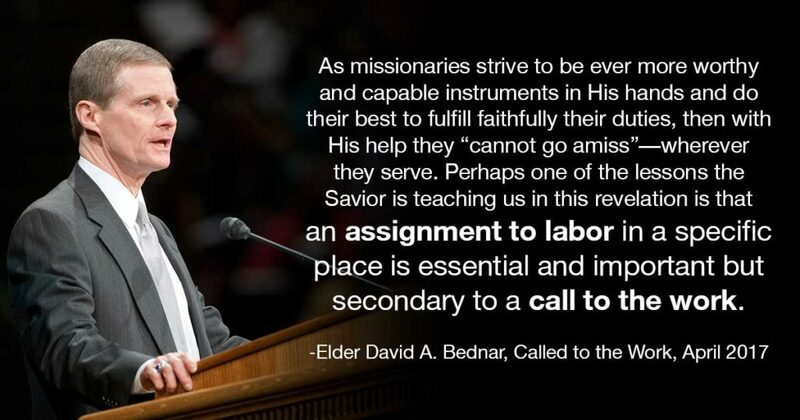 Please note that the first sentence is a call to serve as a full-time missionary in the Lord’s restored Church. The second sentence indicates an assignment to labor in a specific place and mission. The important distinction expressed in these two sentences is essential for all of us to understand. …As missionaries strive to be ever more worthy and capable instruments in His hands and do their best to fulfill faithfully their duties, then with His help they “cannot go amiss” (D&C 80:3)—wherever they serve. Perhaps one of the lessons the Savior is teaching us in this revelation is that an assignment to labor in a specific place is essential and important but secondary to a call to the work. …Three interrelated words define a pattern of preparation and progression for sons of God: priesthood, temple, mission. Sometimes as parents, friends, and Church members, we focus so extensively upon missionary preparation for young men that we may neglect to a degree the other vital steps along the covenant pathway that must be fulfilled before beginning full-time missionary service. Working as a missionary certainly is one but not the only important building block in the process of creating a strong foundation for a lifetime of spiritual growth and service. Priesthood and temple blessings, both of which precede arriving in an assigned field of labor, also are necessary to fortify and strengthen us spiritually throughout our entire lives. …Young men, each of you is a missionary now. 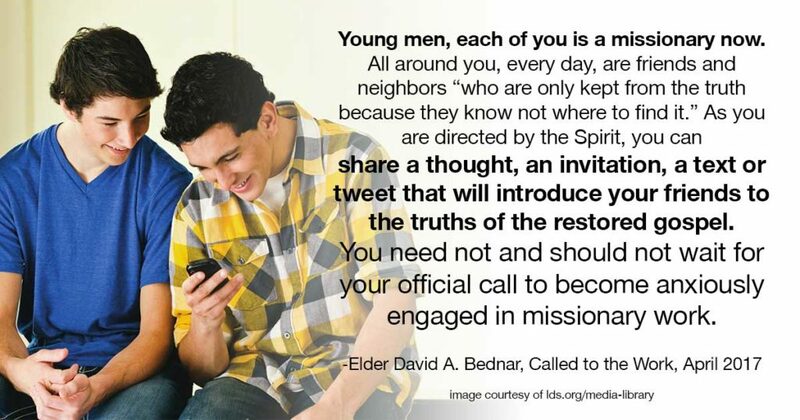 All around you, every day, are friends and neighbors “who are only kept from the truth because they know not where to find it.” As you are directed by the Spirit, you can share a thought, an invitation, a text or tweet that will introduce your friends to the truths of the restored gospel. You need not and should not wait for your official call to become anxiously engaged in missionary work. …In our homes and at church, we should give balanced emphasis to all three elements of the Lord’s pattern of preparation and progression for faithful sons of God: priesthood, temple, mission. All three require us to love being and remaining worthy. Be worthy. Stay worthy. Allow me to share the true story of Alex, a quiet, thoughtful, and bright young priest. One Sunday, Alex’s bishop found him alone in a classroom in a state of great distress. The young man explained how painfully difficult it was for him to attend church without his father, who was not a member. Then he tearfully said it would probably be better for him to leave the Church. Quickly the priesthood brethren and all the ward members rallied around Alex and expressed their affection and support. The high priests group leader, a man of great faith and love, was chosen to be his home teaching companion. Members of the bishopric took him under their wings and made him their closest associate. Today, I would like to share some lessons I learned on my path to baptism—lessons that I hope may help those of you listening who are not members of the Church yet. 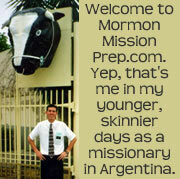 …From my first lesson, I say to you friends and investigators of the Church: once you meet the missionaries, please take them seriously; they are giving up important years of their lives just for you. …Let me put this lesson in one sentence: if you are confused, don’t worry—remember the feelings you have experienced; they come from God. …the third lesson, in one sentence: when you receive these things—the Book of Mormon—and you are exhorted to read and ask God if they are true, please just do it! …the last lesson, in one statement: experience repentance; nothing draws you closer to the Lord Jesus Christ than a desire to change. 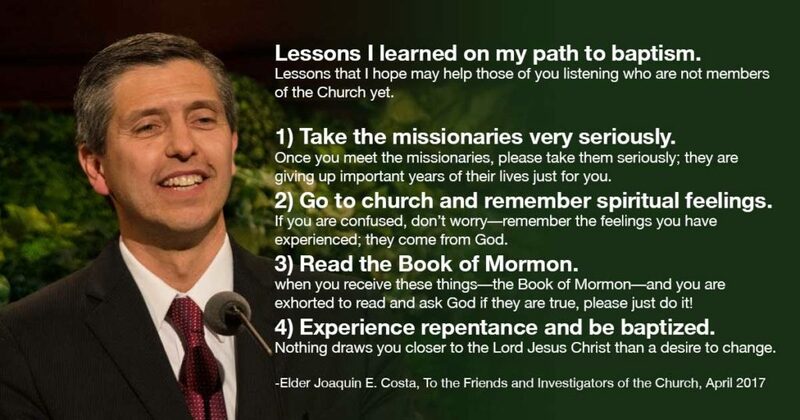 …So please consider my experiences, and (1) take the missionaries very seriously, (2) go to church and remember spiritual feelings, (3) read the Book of Mormon and ask the Lord if it is true, and (4) experience repentance and be baptized. During this time, I worked closely with President Reid Tateoka of the Japan Sendai Mission. As part of his usual mission routine, President Tateoka planned a meeting for missionary leaders in the southern portion of his mission. A few days prior to the meeting, President Tateoka had an impression, a feeling in his heart, to invite all missionaries of that zone to the leadership meeting, instead of the prescribed small number of elder and sister leaders. When he announced his intention, he was reminded that this meeting was not designed for all missionaries but only for mission leaders. However, setting convention aside in order to follow the prompting he had received, he invited all missionaries serving in several coastal cities, including the city of Fukushima, to the meeting. On the appointed day, March 11, 2011, the missionaries gathered together for the expanded mission meeting in the inland city of Koriyama. During this meeting a 9.0-magnitude earthquake and tsunami struck the region of Japan where the Japan Sendai Mission is located. Tragically, many coastal cities—including those from which the missionaries had been gathered—were devastated and suffered great loss of life. And the city of Fukushima suffered a subsequent nuclear event. Although the meetinghouse where the missionaries were meeting that day was damaged by the earthquake, through following the promptings of the Holy Ghost, President and Sister Tateoka and all missionaries were safely assembled. They were out of harm’s way and miles from the devastation of the tsunami and the nuclear fallout. …In order to describe the valuable role of the Holy Ghost as witness, I will continue the story of Fernando and Bayley. If you remember, I shared that Fernando and his brother had been baptized, but his parents and three younger brothers had not. 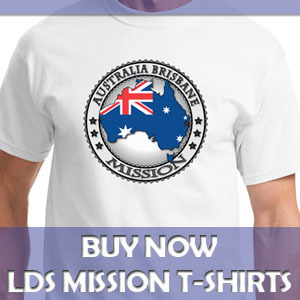 And, despite receiving numerous invitations to meet with the missionaries over the years, each time the family declined. Upon the painful passing of Bayley and her baby daughter, Fernando’s family was inconsolable. Unlike Fernando and unlike Bayley’s family, they found no comfort or peace. They could not understand how their own son, along with Bayley’s family, could bear their heavy burden. Eventually, they concluded that what their son possessed and they did not was the restored gospel of Jesus Christ and this must be his source of peace and comfort. Following this realization, they invited the missionaries to teach their family the gospel. As a result, they received their own witness and testimony of the great plan of happiness, which brought them the sweet peace and calming comfort they were desperately seeking. An experience I had when I was 15 years old was foundational for me. My faithful mother had valiantly tried to help me establish the foundations of faith in my life. I attended sacrament meeting, Primary, then Young Men and seminary. I had read the Book of Mormon and had always prayed individually. At that time a dramatic event occurred in our family when my beloved older brother was considering a potential mission call. 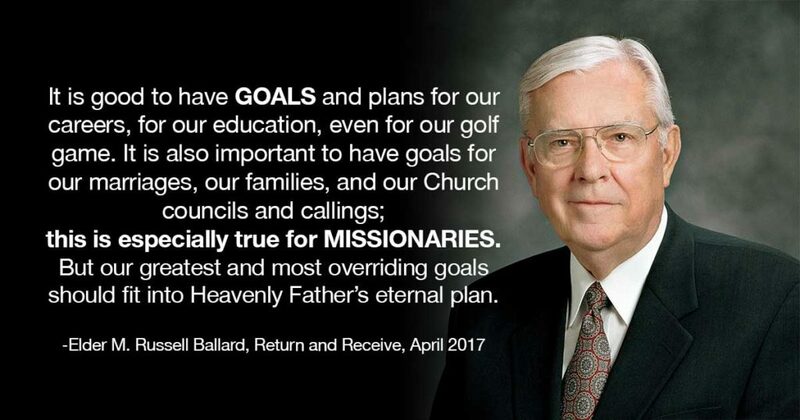 My wonderful father, a less-active Church member, wanted him to continue his education and not serve a mission. This became a point of contention. In a remarkable discussion with my brother, who was five years older and led the discussion, we concluded that his decision on whether to serve a mission depended on three issues: (1) Was Jesus Christ divine? (2) Was the Book of Mormon true? (3) Was Joseph Smith the prophet of the Restoration? As I prayed sincerely that night, the Spirit confirmed to me the truth of all three questions. I also came to understand that almost every decision I would make for the rest of my life would be based on the answers to those three questions. I particularly realized that faith in the Lord Jesus Christ was essential. In looking back, I recognize that, primarily because of my mother, the foundations were in place for me to receive the spiritual confirmation that evening. My brother, who already had a testimony, made the decision to serve a mission and ultimately won our father’s support.